It's been over a year since Apple refreshed its iMac lineup with updated hardware and added Thunderbolt 3. After long-term daily use of the computer in that period, now is probably a good time to reflect on the iMac, and how we feel about the machine a year after release. The iMac 5K has been AppleInsider's main video editing machine since it was released. To make it more useful for the workload, we opted for the highest-specification model with 8 gigabytes of RAM and a 512-gigabyte SSD, a setup that was cheaper than the new top-spec i9 MacBook Pro released in July. The iMac 5K is the only new Mac that allows you to easily add third-party RAM. Taking advantage of this, we added another 32 gigabytes, and now it is equipped with 40 gigabytes for only $3,000 -- $300 less than the 32-gigabyte model from Apple. The best comparison to make with it is against the iMac Pro, the next tier up in terms of specification. For $2,000 more in terms of cost, you'd get an 8-core processor, 32 gigabytes of RAM and 1 terabyte of SSD storage in the base model. It may seem worth it to go with that over the iMac 5K because it should easily outperform the iMac 5K, right? 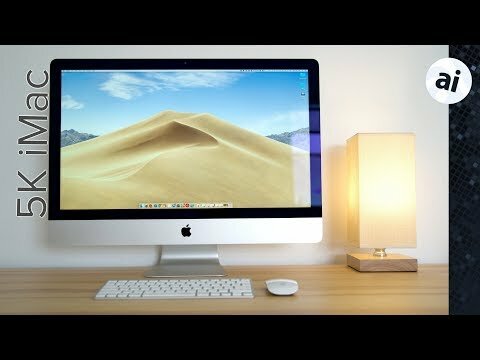 Before we get into performance testing, let's discuss what we like and don't like about the iMac 5K. The design of the iMac 5K and iMac Pro is iconic and high quality, but it's been 6 years since the last redesign, and the large chin is starting to look a bit dated. The 5K display, however, remains amazing, due to its high detail, brightness, and color accuracy. We love the large amount of ports in the back, especially the Thunderbolt 3 ports, which we use to connect a 40TB storage area network device that can be accessed by two Macs at the same time, with the high bandwidth offered by Thunderbolt 3 providing very fast transfers to both desktops. The keyboard and mouse supplied with the iMac are great, with few Bluetooth connection issues since buying it. The batteries stay charged for weeks, and they recharge incredibly quickly as well, which is handy since you have to flip the mouse over to do so. Onto the internals, the 2017 iMac 5K switched over to Intel's Kaby Lake processors, which added hardware acceleration for the HEVC codec, the current standard for 4K video streaming. It also introduced desktop-class graphics chips for the first time in years, and even the cheaper Radeon Pro 570 is substantially faster than the best graphics options in older models from 2015. Our iMac 5K has the Radeon Pro 580, which is actually the same graphics chip that came in the new Blackmagic eGPU, which is mostly marketed towards MacBook Pro users. We have previously compared the eGPU-equipped Core i9 2018 MacBook Pro with the 2017 5K iMac and the iMac Pro, and found that, even with the extra power of the eGPU, it isn't enough to beat our iMac 5K. Starting with Geekbench 4's CPU test, the iMac 5K gets the best single-core score across the models we tested, but also the worst multi-core score, mainly due to the differences in the amount of cores. Under Geekbench 4's graphics test, the iMac Pro is the clear winner. In Cinebench R15, the iMac 5K is not far from the 2018 i9 MacBook Pro in its results, and that's mostly because of the thermal design of the MacBook Pro. The iMac Pro simply destroyed both machines in the test. We also looked at video gaming performance with Unigen's Heaven Benchmark. The iMac Pro did extremely well here, and the iMac 5K easily did better than the MacBook Pro. Onto the real world tests, the Lightroom export test showed the iMac 5K sits between the i9 MacBook Pro and the iMac Pro in the results. The Final Cut Pro X video editing tests started with Bruce X, with the iMac 5K actually scoring incredibly close to the iMac Pro. A 20 second 4K clip stabilization test surprised us, as the iMac 5K was ahead of the other Mac systems by a huge amount. The i9 MacBook Pro destroyed the iMac 5K in the HEVC to HEVC export test, even topping the iMac Pro, because the 8th-gen processor is using the latest QuickSync encoding and decoding technology. The iMac Pro's Xeon CPU doesn't have integrated graphics to enable QuickSync, but the raw power allows it to still get the job done quickly. Moving on to a 5min 4K export, the iMac Pro was actually the slowest in this test, again due to the lack of QuickSync. The MacBook Pro was slower than the iMac 5K, due to the thermal throttling of the processor and the less powerful graphics. For our Canon RAW 60 frames per second test, the iMac 5K was right behind the iMac Pro, while the MacBook Pro was extremely slow. We also tested timeline smoothness during this test, and the iMac Pro was the only one that played it back at the full 60 frames per second. Overall, the top-spec i9 MacBook Pro performs worse than the 2017 iMac 5K in almost all of the tests we ran, which is completely unexpected based off the spec sheet. We were also surprised at how close the iMac 5K performed compared to the iMac Pro, even beating it in some tests thanks to QuickSync. We export everything in 4K as well, which again is faster on the iMac 5K, so this machine really is the best bang for the buck for this particular situation. On the negative side, the fans spin up and get loud when exporting longer 4K videos. I personally prefer using Google Chrome as a browser, and even with 40GB of RAM, the fans can sometimes kick up really loud when I'm researching and opening a bunch of tabs at once. This is more on Google than on Apple's hardware, though. Apple recently added HDR editing support to Final Cut Pro in the 10.14 update, but of course, there's still no HDR display in any Mac device. This hints that Apple will either be working with a company like LG to bring us a new HDR display, or Apple will do it themselves in the next iMac or iMac Pro, or maybe even the rumored Apple Cinema Display, but that remains to be seen. Overall, the 2017 top-spec iMac 5K is one of the best performing Macs ever made, and in our opinion, the best bang-for-your-buck Mac in terms of performance. Apple authorized resellers are currently discounting every iMac 5K by $80 to $200 thanks to instant rebates and/or coupon discounts. For the latest deals and up-to-date pricing, please visit the AppleInsider 2017 27-inch iMac 5K Price Guide. I am still praying for a new Mac Mini. Mr Tim & Jony ,please grant our wish for a new Mac Mini with a SSD option. Vadim, it's better to say, "the number of cores" not "the amount of cores". I'm waiting for Apple to update the iMac...then I just might pull the trigger! Ditto for the number of ports. Sorry to be all didactic, but amount refers to something that's either continuous (say, a liquid or a dollop of mashed potatoes), and number refers to something that's discrete and countable. If anything the Mac Mini should be discontinued. It has never been very Apple like in design. It’s downright ugly. It was brought out because of all the whining about a cheaper headless Mac from the few who don’t like all-in-ones. The Mini has never sold very well because its market is limited to a tiny minority of Mac users. That kind of market is best left to the cheap PCs you can buy at Walmart for $400. I hope Apple kills this abomination once and for all. My only wish for the iMac is, that they would increase the screen size. Something like, 24" and 30". 21" is just too small for a desktop. And while 27" is too big for the needs of users like me, I'm sure pros who really need a bigger screen would do well with a move to 30"
I would gladly trade a minuscule amount of performance for user replaceable RAM and Storage memory. A return to the G5 iMac ideals of repair-ability in the next design would be fantastic. I would buy immediately. And it would reduce that disquiet about Apple I feel whenever I see how much it is ripping us off for higher levels of RAM and memory storage. Needless to say, not under current management. I'm waiting for a reasonably priced and spec'd headless mac. I will not buy an all-in one, especially these iMac's as they have serious thermal limitations. I would ask if locked in storage is in part parcel of AR/AI and data collection (if encrypted) that reinforces accuracy of such, rather than any pursuit of lightness or other purported design goals...? Some here seem to rely on secure storage and current policy respecting privacy, and yet what happens if either of those were to change, and everything in the iCloud were no longer private, or accessed under the Patriot Act, or experience a major hack by hostile interests, vs a 16 year old from Australia ? I ask the same question about iPassword? Is it a question of design, centralized digital access, ease of data download, or maybe wishful thinking, or simple logic of single source convenience and efficacy in a 140 character (now 240) world ? Additionally the 5K question seems valid, alongside the question of support, with a 2009 mini supporting 4k30 out of the box, yet a 2011 mini with discrete graphics unsupported, despite SwitchResX confirmation of 4k support ? Is Apple is holding back by design, and if so how should customers respond ? Would like the iMac to pick up Space Gray color and add 2 additional thunderbolt 3/usb C ports. Basically an iMac Pro without the internals that make the price astronomical. I’ve been using this iMac since late 2017 and it has been great! Good to see it treating AI the same way. I’m glad Apple is making awesome iMacs again! nothing should have the name Pro on it if we can not access memory and drives! This is the machine I will get if Apple doesn't release their promised new modular Mac sometime soon. that being said, I've considered trying a stab at a Hackintosh so I can replace a drive if it goes down which takes 10 minutes instead of a week at an Apple store, but really don't want to risk updates rendering it dead. At least the Mac Mini was easy to switch out parts! When they killed the cheese grater, they left people hanging. If they want to call an iMac PRO, then put a door in the back to access memory and drives at least. I've been using iMacs since...well...i upgraded from a Starmax clone. I had a Duo230, and a string of Performas, but iMacs since then. Im gonna have to rethink it when the time comes. A $3000 iMac? Uhh...no. I'm seeing really nice 4k displays for under $500. I may go with a MacMini if it gets updated and will drive a 4k display. Or make replace my MBA with a MacBook and use it in clamshell mode. Will just need to see what is available when the time comes. My needs are modest, as I do no graphics work. Kinda sad to see the iMac simply not meet my needs at an affordable price. So basically you're waiting on either a Mac Pro which isn't really gonna be reasonably priced for most people, or a Mac mini which will have WORSE thermal limitations than the iMac. I guess you're gonna keep waiting for a long time. I'm not sure what you're doing that requires something other than an iMac. You do know the 27" 5K iMac starts at $1650 on B&H, not $3,000 as you suggest and if your needs are modest then thats all you need. If you can settle for any kind of Mac mini or MacBook Air replacement then you can settle for the lowest end 27" iMac which will also allow you to add RAM later on if that's a concern whereas the other Macs do not. It’s been 5 years for this form factor, and 9 years for iMacs with 21.5” and 27” displays. Hoping this 16 to 18 month period of no iMac update means a new form factor with new display sizes, 24” 16:9 and 34” 21:9. A 34” 21:9 display at something like 6720x2880 would be sporty, but 8K will be coming sooner or later. You know, this is fair. But the monitor/display should last for a long long time. Maybe it is time to separate the two, and then upgrades/ replacements are more tenable. I guess I've just gotten to the end of the iMac being my only choice. I really did like that Duo. I wore it out. 3 new replacement keyboards, and one logic board. I only had it for like 5 years, but it seems like it was forever. I guess you never forget your first mac. Since the days of my “iLamp G4” I was always going for Laptop + Screen because of the portability versus power. The iMac 5K was the first Mac to convince me to try again a desktop. Ok, lack of decent Apple made screens (I am like that) plus my iPad Pro made that choice easier. Never looked back so far. Great machine. Did it come with one single 8gb stick and you added another 2x16gb still leaving one slot free? o.O A bit unusual since I'm used to getting stock configurations with multiple sticks of lower capacity (as they are cheaper) than less sticks of higher capacity.